Wyoming’s Melvin Brewing opened the doors to its first brewpub on June 3rd. Featuring 20 taps including a rotating guest tap with the best damn, sought after IPAs they can get their hands on, and bar and dining menu created by local favorite, Chef Drew Trepanier. On Monday, August 14th, hours of operation will be from 11 a.m.-11 p.m. with all day dining and Seahawks games show on four large screen TVs throughout the pub on Sundays. Melvin Brewing will offer a selection of 20 handcrafted beers on tap ranging from $4-$9 each. Featuring Melvin classics such as 2×4, Hubert, Melvin IPA, Killer Bees, and the Rotational IIPA series (RIIPA) — Asterisk, Citradamus, Drunken Master and Lambda Lambda Lambda. Wines and Prosecco by the glass and bottle highlighting unique varietals from California, Oregon and Washington. Glasses start at $6 and bottles start at $24. Also, fill your own Growlers and Crowlers (32 ounce can via a canning machine). American brewpub fare with Pacific Northwest inspiration and featured highlights from Melvin’s original brewery and restaurant, Thai Me Up in Jackson Hole, WY. Highlights include the Melvin Burger–Beef, Bacon, Egg, Shisito Pepper and Chili Mayo and TMU Wings–Crispy Wings with Sweet & Spicy Chili Sauce. Kids menu includes fan favorites such as Goldfish Mac & Cheese, mini Flat Iron Steak and Grilled Cheese. Happy Hour is everyday from 4-6 p.m. (all seatings) and 9-11 p.m. (bar only) with daily food and beer specials. Melvin features a modern rustic design with nods to their Kung Fu beginnings. Specific design elements include: 5,000 square foot open floor plan with floor to ceiling windows looking out upon the streetscape, 160 seats broken out by 13 high tops, 20 bar stool seats, and a mix of tables and booths with bench seating made for sharing. The second floor center of the space is home to the mash tun and kettle. The 7-barrel brewing system is alongside the kitchen for all to see brewing in process. The walls are adorned with original Melvin artwork showcasing event posters and labels. Melvin Brewing was founded in 2009 by Jeremy Tofte and Kirk McHale to fulfill their need to drink the biggest, most exciting West-Coast Style IPAs in Jackson, WY. Experimenting on a 30 gallon, then three-barrel brew house system, they developed the Melvin IPA and 2×4 Imperial IPA, which went on to win gold medals at the 2012 Great American Beer Festival, back-to-back Alpha King awards in 2012 and 2013, and a Gold Medal at the World Beer Cup. On the strength of these and other beer brands, Melvin Brewing was awarded the 2015 Small Brew Pub and Small Brew Pub Brewer of the year. Melvin brewing now has more than 40 amazing beer recipes to its name, expanding its portfolio of hoppy beers and other styles, with brands or beer syles such as ChChCh-Cherry Bomb (Fruit Beer), Killer Bees (Honey Ale), Coffee Ruckus (Coffee Imperial Stout), Wu’Wit (Belgian Wit), Hey Zeus! (Mexican Lager). 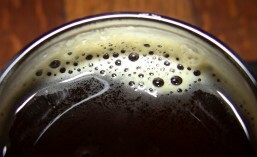 Visit Melvin’s Web site, http://www.melvinbrewing.com/ for additional launch dates, updates and sample opportunities. The only food I’ve had from Melvin’s Bellingham menu was the Melvin Burger (as described above). It was huge and quite delicious. I consider myself somewhat of a burger aficionado, and Melvin does it right. The burger was juicy, flavorful, and well-assembled. If their other food offerings are half as good as the burger, you’ve got nothing to worry about. Between the great food and awesome beer selections, a stop at Melvin is a must the next time you’re up in Bellingham. Prepare for Wu Tang and old Kung Fu movies on the TV. This entry was posted in Ale, Beer, Bellingham, Best Of, Brewery Expansion, Brewery Opening, Brewing, Brewpub, Canning, Cans, Craft Brewery, Distribution, Draft, Events, Expanded Hours, Expansion, Food, Grand Opening, Hops, Imperial, IPA, Local, On Tap, Opening, Product Review, Promotion, Restaurant, Seafood, Seattle, Stout, Summer, Taproom, Taproom Opening, Taps, Tasting, Tour, Travel, Triple, Washington, Washington Beer, Wyoming, Wyoming Beer and tagged 2017, August, beer, Bellingham, Brewpub, events, Expansion, Extended Hours, Food, Melvin Brewing, seattle, Washington. Bookmark the permalink.